Happy February, #GenXYZ! It’s a good thing we have a leap day this year, because this month has been jam-packed with excitement. With the Super Bowl, college football National Signing Day, and NBA All Star Weekend all in February, there is plenty to keep us entertained in the sports world. So for this week’s #WebsiteWednesday, we decided to take a hiatus from sports and talk about the other big event on everyone’s mind this month: Valentine’s Day. With less than a week until Cupid gears up his bow and arrow, everybody is dusting off their social media profiles and downloading the latest dating app to their phone. But with GetSerendipity.xyz, you can put a whole new spin on the way you go about finding that perfect match – but instead of romance, it’s professional! 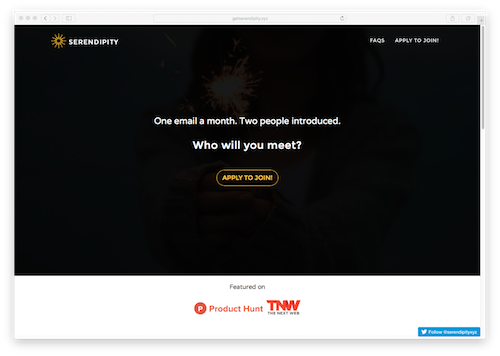 GetSerendipity.xyz limits the number of people its users meet by only sending them one email introduction per month. On top of eliminating the tyranny of choice – this fresh, modern take on matchmaking gives you the proper time you need to get to know somebody and make a genuine connection. This means that you can be more effective about the way you go about growing your network. Plus, it’s like sending yourself a cool and exciting surprise in the mail each month! So this Valentine’s Day, if you aren’t feeling the love – or if you just want to take some time away from pink hearts and roses – add a little kismet to the way you meet people with a creative and fun .xyz website: GetSerendipity.xyz! « Previous Post China Blog Series: 新年快乐!